At best, insurance is a crucial investment that leads to peace of mind after large educational technology expenditures. If something goes wrong, the insurer pays the claim. At worst, insurance premiums siphon money from school coffers while lining the pockets of distant company executives. Faced with the inherent risk of purchasing and maintaining more than 500 Apple iPads, John Connolly carefully pondered these scenarios. For the director of technology at Consolidated High School District 230 in Orland Park, IL, the question of "to insure or not to insure" hinged on whether students would be allowed to take the devices home. For District 230, the answer was no--at least for now. Armed with that crucial piece of information, Connolly decided to decline the AppleCare Protection Plan and eschew any extra insurance. "It ended up being a fantastic decision," he says. 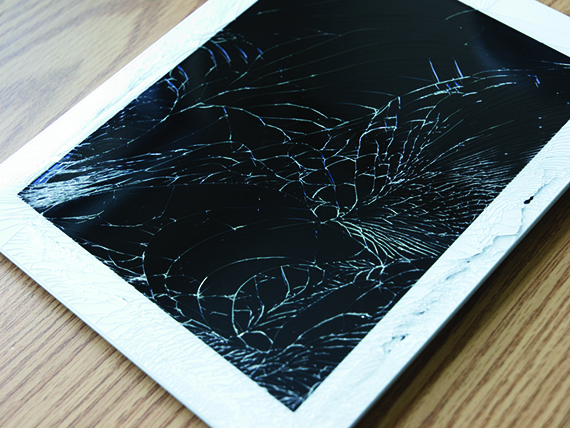 "If you're planning on buying tablets and keeping them in-house, insurance is not worth it." Responsible for the technology needs of 9,000 students spanning three high schools, Connolly was able to save the district money thanks to a relatively low percentage of damaged units. He says that the iPad ended up being a "really durable device," and Connolly used the money that would have gone toward AppleCare or insurance to purchase additional devices in case of damage. This type of "self-insurance" requires an affirmative plan to set aside funds that would have been used for insurance and use them instead to repair or replace devices as needed. It's an appealing scenario, but not without risk. "If you end up having $20,000 in the pot, and halfway through the year you've already gone through it, what do you do with the second half of the year?" muses Connolly. "So there is higher risk with that approach." Officials at nearby districts have opted to purchase insurance to essentially avoid all risk. Connolly understands the sentiment, but can't help but cringe at the thought. "Insurance companies would not be in business if there was a loss," he says. "They collect more money than they need, and at the end of the day, they are going to keep it." When Connolly's district inevitably goes 1-to-1, he believes things will change. While he says that "you need insurance if kids are taking devices home," Connolly is exploring a "hybrid" option that may serve as a compromise between self-insurance and "real" insurance. The hybrid approach involves an outside company managing claims and making sure equipment gets replaced within a certain time. "If all the money from premiums is not spent at the end of the year, it gets rolled into the next year, so it stays with the district," explains Connolly. "The outside company's concept is to work with multiple districts, and if they can get enough districts on board, then the cost for them ends up being small across the board. They take a small set fee to manage it. From a district standpoint, it's not a big financial hit. The idea of paying a traditional insurance company that keeps the inevitable surplus does not sit well with me." Like Connolly, officials at Poudre School District (PSD) in Fort Collins, CO, decided not to purchase insurance. Students at all six high schools in the district have 1-to-1 laptops that cost about $700 each, and parents pay a one-time $50 fee that helps cover repair and replacements for all four years that a student uses a computer. For districts pondering a similar fee aimed at parents, Donald Begin, director of information technology for PSD, cautions that officials should be extremely clear about what the fee covers. At PSD, the $50 does not go toward an insurance premium, but instead toward a self-insurance fund that covers repairs and replacements. According to Begin, PSD's school board has mandated self-insurance for all devices with a value of less than $5,000. Even $2,500 interactive whiteboards have no insurance. Only "major servers" in the data center are insured beyond the plans that cover building contents in cases of fire, earthquake, or other damage. Begin admits that it is still too early to tell whether the $50 fee was a wise choice. "We spent a lot of time researching, studying, and speaking with school districts larger than us that had done 1-to-1 programs for a number of years," he says. "We took the best practices from each of those programs." PSD also took out warranties on all of its equipment, typically lasting four years. "We also have self-maintainer agreements that allow us to do the repairs and be reimbursed for conducting those repairs rather than calling on the manufacturer to send someone out," explains Begin. "It's a combination of the warranty, the self-maintainer agreement, and the self-insurance." Cameron Chamberlin, technology director for the 590 students of Cardinal Community School District , believes that insurance makes sense on 1-to-1 devices that students are taking home. Officials at his district in Eldon, IA, bought a policy that recognizes the fact that students may not always be the gentlest of stewards. "We decided to insure our 1-to-1 Kuno Android tablet because those are in the hands of the students, and that's where most of the damage occurs," he says. "We have a policy through the Worth Avenue Group, which has no deductible, and if any damage occurs over the life of the three-year plan, they replace [the tablet]." The Cardinal District insurance plan costs about $30 a year per tablet. Replacement without insurance would be in the $300 to $400 range. "So far I've seen quite a bit of small damages that occur, and [the tablets] don't function after that," laments Chamberlin. "Middle school is probably where we see the most damage. We handed out Bradford laptop bags for the tablets after the first couple of weeks, and I recommend other districts also offer bags even if they buy insurance." Does an "easy replacement" mindset make students careless with their tablets? Chamberlin doesn't think so. "Students come up to me if it's damaged and they feel bad about it," he says. "They don't want to tell me, but they have to because all their work is pushed through the cloud. I don't think it creates carelessness. The students I've seen damage with, I would have expected it no matter what." Cardinal Community's desktop computers are covered as contents under normal building insurance, but not insured for any kind of damage apart from that. "A three-year warranty is built in on a lot of electronics we have," says Chamberlin. "Copiers are not covered because they are under a maintenance agreement with the manufacturer." Like Cardinal, the Hawaii State Department of Education prefers to err on the side of caution, at least at first. David Wu, the assistant superintendent for the Office of Information Technology Services, says, "We believe it is wise to invest in insurance for devices when initiating a new program/project as a safeguard against unknown factors of dependability." He goes on to say that, "As the inventory grows larger and older, it becomes cost-prohibitive to maintain insurance. We then encourage employees to take good care of devices and store them in safe areas to reduce the need for replacements." Rather than a rigid policy to terminate insurance policies after a certain time, Wu says, "We allow school program managers to decide whether to let the policy expire or to extend it." Making this sort of decisions means increased responsibility for technology directors across the country, but Dave George, director of risk management at the 53,000-student San Francisco Unified School District, predicts that the role of insurance may diminish over time. "Technology tends to get cheaper, not more expensive, and I think that plays a lot into the insurance equation," he says. "It makes insurance less relevant, because when you go to replace something it might be half the cost of what you paid for it to begin with." Some districts may be opting out of insurance, but what about paid warranties? In a recent T.H.E. Journal article, "The Incredible Shrinking Budget," Ann Dunkin, director of technology at Palo Alto USD (CA), says, "The prior CTO had been purchasing the gold-plated warranty for four to five years. The math said that just didn't make sense. We moved to a three-year warranty (one plus two extended) and the next level of warranty down (parts and labor) and saved several hundred dollars per computer." Steve Young, chief technology officer at Judson ISD (TX) has a different approach to saving on warranties. He says, "Recently we purchased some relatively high-end refurbished equipment with five-year warranties, which we feel is a very sustainable practice. We are able to reuse some gently used computers, which are very high-quality computers, and should work very well for our staff for many years before we end up recycling them. The refurbished equipment is saving us at least 50 percent up front, and should it work well in its five-year life span, then the savings should be about 50 percent, which in this initial trial should be greater than $125,000." A rigorous cost/benefit analysis took warranties largely out of the picture at the Iowa City Community School District . David Dude, the COO/CTO for the district, explains that the decision to forgo warranties evolved during the creation and implementation of a computer allocation system. Instead of buying the pricey warranties for new computers, Dude calculated the cost and determined that the money could best be spent elsewhere. "We could take about a third of that money to buy additional computers and have a source for parts and replacements," he says. "Now when a computer has a problem, we can just swap it out because we have a replacement. The end user does not have to wait for the work to get done." This process of "cannibalizing" has applied only to desktops and laptops, so far. "For the other hardware we're buying, such as projectors and document cameras, we just take the standard warranty that comes with it," says Dude. "We're kind of early on in adopting that technology, and we're not sure what the life cycle will be." According to David Wu, assistant superintendent for the Hawaii State Department of Education's Office of Information Technology Services, "When warranties tend to be cost-prohibitive, schools are advised to purchase additional units to be deployed as loaners, or serve as a bank of spare parts, for any unit that may need repair."